I can't believe I'm even typing this, but on September 15th the second Geeky Chef Cookbook is going to be released. That's second as in two! Two cookbooks! And this is a sequel that lives up to the original. In my humble opinion, it's even better. You can preorder the book now on Amazon so you can get it the day-of. So, to celebrate, I'm going to be releasing a couple of recipes directly from the book. 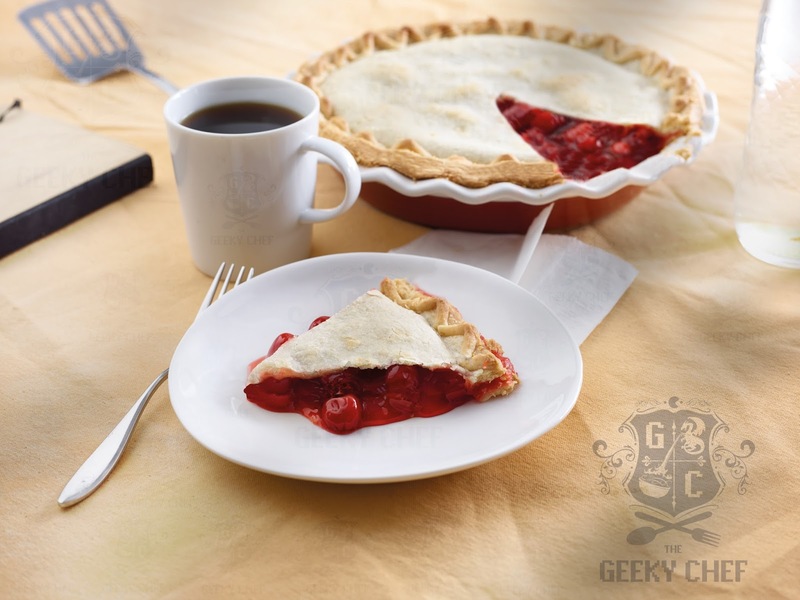 This upcoming Sunday will be the season finale of Twin Peaks: The Return, so the first recipe I'm teasing is Norma's Cherry Pie from Twin Peaks. Twin Peaks is one of my favorite shows ever. People who visit my house in the pacific northwest will note the Laura Palmer's homecoming picture on my fireplace and the painting of Snoqualamie Falls on my wall. Now, I am aware that cherry pie is a real thing, but any Twin Peaks fan knows this is not just any cherry pie. There’s something miraculous about this pie. I used two sources of inspiration for this recipe. One is my grandmother's own cherry pie recipe, which has been in the family for generations. The other is the cherry pie at Twede's Cafe, which is the filming location for the RR and one of my favorite places to visit in the Seattle area. It might be location magic, but I swear that the cherry pie at Twede's is the only one that comes close to my family's recipe. Just remember to wash it down with a cup of that damn fine coffee! 1 Preheat the oven to 400°F (200°C). 2 Drain the cherries, reserving ½ cup (120 ml) of the juice. Set aside the cherries and the juice. 3 Combine the dry ingredients—the sugar, cornstarch, and salt—in a mixing bowl. 4 In another mixing bowl, use a spoon to combine the wet ingredients—cherry juice, almond extract, and lemon juice. 5 Add the wet ingredients to the dry ingredients, mixing well. Add the cherries and mix again. Stir in the butter, then let the filling sit for about 15 minutes. 6 Pour the cherry mixture into the pie crust and top with another layer of pie crust, sealing the sides with your fingers. Brush the top of the pie with the egg white, then use a knife to create vents. 7 Bake for 45–55 minutes, or until the crust is golden brown. 8 You can serve the pie warm or let it cool to room temperature before slicing and serving with whipped cream. 1 Mix the f lour, sugar, and salt in a food processor. Slice the butter into the processor and pulse everything until it forms crumbs. Blend in enough ice water to create moist clumps, but not so it is all stuck together. 2 Gather the dough into a ball with your hands. If you’re making double crust, divide the dough in half and form into 2 balls. Flatten into disc(s), wrap in plastic wrap and chill for at least 2 hours. This cherry pie is very tasty. Enjoy with a glass of jasmine tea added, not wonderful.